It is no secret that medical costs have skyrocketed over the years. The astronomical prices of hospital stays, procedures, and prescriptions are debated in the news almost every day. 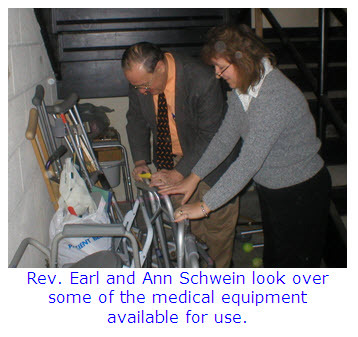 Agawam Congregational Church, UCC, has come up with a way to help with the cost of one medical expense - medical equipment-through their Lending Cupboard. The Lending Cupboard is a ministry that provides medical equipment items to members and their families throughout the year. Supplies such as: hospital beds, wheelchairs, canes, walkers, commodes, crutches, transfer boards, bath sets, grabbers, a "scooter", etc., are all available for use at no charge. All one needs to do is call the church office, pick up the equipment, sign out the item, and return it when it is no longer needed. "Medical equipment is very expensive," said Ann Schwein, secretary at Agawam Congregational. "And I suspect this ministry began when some generous members of our church had extra medical equipment that they wanted to donate in case someone else was in need. "The extra equipment is stored in the church basement. The church office keeps track of what is on hand and keeps the sign out list of who has what. Many items are in constant use, so there is plenty of space for other donations. The ministry has grown over the years, as more people donated their no-longer needed items. Senior Pastor Rev. Earl Eisenbach said: "This ministry is part of our caring ministry. Word has spread around by word of mouth throughout the community and this ministry meets the needs of the greater community. The more we receive, the more we loan out." "This is a wonderful ministry that helps anyone in need," said Schwein. "All you really need is extra space to store any donated items, and you are helping folks save money." You can contact Eisenbach or Schwein at the church office at: (413) 786-7111 or office@AgawamCongregationalChurch.com.